at the recent National Academy Finals. August 1997. The William Woods University campus had a different look then: the school had admitted its first male students. Little did those who made that decision imagine that two young people who met during those years would marry and become one of the more successful and hard-working young training teams in the Saddlebred world today. Mary Marcum came from the very small town of Fall River Mills, Calif. Her selection of William Woods was a late decision. Coming from a primarily western and Arabian background, she knew nothing about an American Saddlebred. Pistol took Mary to the show ring. They showed hunt seat, trail, ladies sidesaddle and western. But Mary didn’t stop there. Rather she showed everything Hall would put her on. They did well on the regional level. Mary and her brother, Jeff, took different routes as far as sports were concerned. Where she followed horses, he was an avid skier. On weekends, one parent took Mary to the farm; the other took Jeff to the slopes. The siblings were close and lived what might be called a charmed life in that tiny town that Mary describes as being two and a half hours from the nearest Wal-Mart. Reality came crashing down three days before Christmas 1993, when Jeff was killed in an automobile accident five miles from home. So was Pistol. “When I put my arms around him, I felt that in some way he knew what had happened,” Mary said. Hall concedes she was hard on Mary, teaching her the business from the inside out. When the admittedly “somewhat spoiled” girl acted out, Hall brought her up short. The barn was the one place Mary could get away from the constant reminders of her brother’s death. “I wasn’t Mary Marcum who lost her brother when I was with my horse,” she said. She, Hall and Pistol took to the road. At the Arabian Regionals, they earned more championships with that one horse than others who brought 20 head. They were number one in the nation. Still, Mary didn’t feel she was good enough to compete at the Nationals. Mary, her instructor and Hall’s daughter, Lynn, stepped out again the following year. Although Mary went half-way across the country for college and today is almost as far away from Red Bluff, Calif., as is possible, she and Hall remain close. They speak at least every week. Mary wanted to train horses; her parents thought she should become a veterinarian. She applied to 11 schools – anything that had an equestrian science program, Mary explained. They visited them all. Mary’s parents had heard of William Woods’s Professor of Equine Studies, Gayle Lampe, and her father had Lampe’s book. They told her to meet the professor who would become her freshman advisor and friend. “Miss Lampe told me ‘You are going to take Saddle Seat and this is what we’re going to do. It opened a whole new world in the sense of what the American Saddlebred was,” Mary said. Rubsam introduced Evan to Cathy McKinley, owner of State Line Tack, and her mother, Joyce. Cathy McKinley recalled the young man she calls “a great big, tall kid that the wind could blow over. “Evan was probably a junior in high school when he came here. He came down in the summers and stayed with my folks,” she said, adding that Evan rode and helped in the tack shop as well. 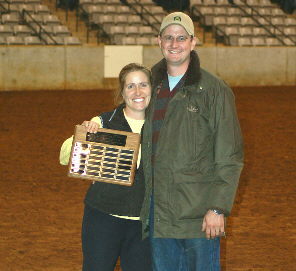 Cathy McKinley had graduated from William Woods University and arranged for Evan to lease several William Woods’ horses. Her letter to Gayle Lampe helped open the door for young men to enter the university. Evan says the students three years above them had been used to an all-female college. Some upperclassmen weren’t that receptive. “A few didn’t want there to be men coming on their turf. It wasn’t a hostile environment; the other 99 percent were glad the transition was being made. It was kind of a shock to the whole system. Deardorff, daughter of trainer Don Deardorff of Molalla, Ore., was in her final year of equitation competition. “Allison was gone every weekend. I had no clue she was in training with the Shivelys. I just knew she was horse crazy like I was. One weekend she said she was going to New York. When I asked why, she said it was to compete in the Finals,” Mary said. “I met Mary the first day of school and had no idea about her background. She asked if I could help her which I did. She kept getting better and better. By the time she was almost done, she didn’t need anybody’s help, that’s for sure,” Deardorff said. In many respects, Mary was (and is) a starry-eyed, giggly girl. “I’m Mary Marcum from Fall River, Calif., and I have a question” became her mantra. She spent every possible waking moment at the barn. It was something Lampe noticed. The university had a work-study program to help pay expenses for students to show. Mary’s job was to work with Lampe and her horses. Although she enjoyed her Kentucky summer, Mary realized that was not the place for her. A friend suggested she talk with Kim and Peter Cowart. “I told Miss Lampe, ‘I am going to North Carolina. I’ve heard Peter is tough to work for but I think I’m ready for something different,’ ” she recalled. “I walked into the most amazing season. I got to take care of A Sweet Treat. I had Gypsy (Supreme) and took care of CH Winterfest. I rode every mile Kim rode with Sweetie at Louisville. I was with her every step of the way and went running in with Kim when they won the Three-Gaited World’s Grand Championship. Emily Hess and CH Gypsy Supreme were reserve in 14–15-Year-Old Five-Gaited World’s Championship and tied reserve in the stake. Hess and CH Winterfest won Lexington’s Junior Exhibitor Three-Gaited Show Pleasure Championship. “I learned a lot more in that summer – and lost a lot of weight I needed to lose. They invited me back next year,” Mary said. The following summer, Mary learned first-hand the vagaries of the horse business. The world’s grand championships went to other barns. Mary worked part-time for Virgil Helm and pursued a Master’s program. She had a year and a half to decide her career path. With both being in equine studies, it’s not surprising Mary and Evan became close friends. Evan was ambivalent about his professional future. He interned one summer in a human resources position. After graduation, he worked briefly for a medical products manufacturer in Ft. Worth, Texas. After his mother died, he and Mary got really close. “Not long after I graduated, I enrolled in the St. Louis University’s law school. I did orientation and in the second day of Torts class, I wasn’t taking notes or paying attention. I realized I was going to spend a lot of time in class doing something I didn’t want to do,” Evan recalled. “Mary had helped me move into my third-floor apartment and a week later helped me move out. Dad’s health wasn’t good, so I went home. Evan decided if he were going to be in the horse business, he’d best get immersed in it. He accepted a job working with Tom Bombolis and John Conatser at Glenmore Farm. When Mary finished her Master’s program, she was ready to set out on her equestrian career. She had worked part-time for Virgil Helm, a man she describes as “nice and quiet. He told me I needed to be around people. He said he thought Cash [Lovell] was a heck of a horseman who did amateurs. At Lexington, I went to Cash and Parker, telling them I knew they were looking for a riding instructor. For some reason, I thought they were the match. Evan proposed in October and moved to North Carolina in January. He went to work for the Cowarts at West Wind Stables. He and Mary lived on the Cowart farm with Mary commuting the 40-plus miles to the Lovells. They were married January 3, 2004. “The day I got married, my horse died. When we were on our honeymoon, Evan didn’t want to tell me. Pistol knew he could go because Evan would take care of me now,” Mary said. The two have settled into life in the Carolinas. They share a lovely home with two dogs, Sarah and Molly. And they work long days. About the time they finish with the training horses, it’s time for Mary to begin teaching. “From 7 a.m. to 4 p.m., we train horses. Between then and 7 or 8 p.m., I teach riding,” Mary said. “I never really wanted to just be a riding instructor. I really enjoy the amateur and kid horses and the equitation horses. Getting a horse ready for someone else, finding the right one is an art form. The Orrs’ success shows through the performance records of Cash Lovell customers the past few years. Vickie Byrd with Attaché’s Crown Royal, Kate Bryan and CH Sportster, Donna Fitch and CH Riva Diva, Sarah Beth Longworth with CH Diamond’s Hope and Kalarama’s Shiraz, Susan Hollowell and Catalytic, Anna Drew Jackson with Cameo’s Carte Blanche, Sarah Martin aboard I Believe I Can Fly and Corinna’s Star, Margaret Morrison and CH The Showstopper, Alex Foster with Wait And See’s Postmaster, Katie Morrison, Drew Taylor Hewitt aboard Perfect Offering and Geoff Bodenhorst are but a few. Add to those, such equitation stars as Cagle James, who shows Seattle Song, and Stephanie Brackett with Much More Radiant and you have a show string any trainer would covet. Mary’s personal highlights involve the youngsters she teaches. Jackson’s 2005 world’s championship with Cameo’s Carte Blanche and Longworth’s Lexington win with CH Diamond Hope rank near the top. For Evan, heading Susan Hollowell and Catalytic after they won the Ladies Fine Harness World’s Championship in 2005 heads the list. The Lovell academy program has blossomed in the past four years Mary has been there. Children, particularly little girls, are everywhere on weekends and some evenings. The Orrs took 13 youngsters and six horses to the National Academy Finals in Murfreesboro, Tenn. Six ‘show customers’ went along to help. Vickie Byrd was among them. “I see her with the children all the time, but that weekend I was really in the midst of how she interacts with all these kids. She is so great with these kids. They love her to death. I see how she encourages them. Mary is strict with them and teaches them a lot besides riding. Cathy McKinley took a frank look at the young couple and their relationship. “I am really proud of Mary and Evan; they complement each other. From the outside looking in, it appears Evan has left his male ego behind. He adores Mary and likes to put her in the limelight. There appears to be no professional jealousy between the two of them. He is equally as valuable as she is, but he’s happy to let her shine. He steps back and does what is necessary. There is a wonderful song that says “You Are The Wind Beneath My Wings.” That might be the best way to describe the Orrs’ relationship. Parker Lovell called Evan as the strength, the steadying force behind his wife. “Evan talks about how he is quiet. He is why I can be me. I’m the one who is loud and out front. He takes care of me, takes me to the doctor when I’m sick. Evan is my rock,” Mary said.